A staggering 20 wickets fell on a dramatic second day as India shot out South Africa for a record-low first innings score of 79 before setting the visitors a formidable target of 310 to win the third and penultimate cricket Test and clinch the series. At stumps at the VCA Ground, Jamtha, South Africa were struggling at 32 for two with opener Dean Elgar (10) and captain Hashim Amla (3) battling it out at the crease after the dismissals of Stiaan van Zyl (5) and night watchman Imran Tahir (8). On a pitch that saw vicious turn, a record 20 wickets fell during the day after the dozen yesterday to turn the contest into a lop-sided one in favour of the spinners. This is the highest wicket-fall in a single day in India after 20 wickets fell in a day during the India versus Australia match in Mumbai, 2004. India, after taking a handy lead of 136 runs, went for quick runs and were all out for 173 in the second, which left the visitors with more than three full days to get 278 more runs to win the game and keep the series alive for the fourth tie at Delhi commencing on December 3. Considering the state of the pitch and the happenings of the first two days, the match is all set to end on the third day on Friday, most probably in favour of India that will mark an end to South Africa's enviable nine-year unbeaten Test series away from home record as they are trailing the hosts 0-1 in the four-game rubber. Opener Shikhar Dhawan (39), one-down Cheteshwar Pujara (31) and no. 6 Rohit Sharma (23) were the only batsmen in the Indian second innings to get into the 20s as leg-spinner Tahir picked up five wickets and speedster Morne Morkel got three. In the morning itself expectations were high that the Indian spinners would create mayhem on the venomous track after the Proteas resumed at the overnight 11 for 2 in reply to the hosts' modest tally of 215. True to predictions, Ravichandran Ashwin (5 for 32), Ravindra Jadeja (4 for 33) and Amit Mishra (1 for 9) combined forces to slice through the nervous Proteas' batting order and shoot them out for their 12th lowest Test score and their worst since readmission to international cricket in the early 1990s. The visitors lost eight wickets this morning after resuming at the overnight score, in one and a half hours' batting during which they faced 24.1 overs. It beat the previous low of 84 against India made in Johannesburg in December 2006 as well as the previous lowest in this country of 105 in November 1996. It's also their lowest total since returning to international cricket after the end of apartheid in the early 1990s. None of the Proteas' batsmen, barring to some extent left handed Jean-Paul Duminy, who top-scored with 35 in 65 balls and 71 minutes after being let-off twice, showed inclination or skill to counter the threat posed by Ashwin and Jadeja. Off-spinner Ashwin bowled unchanged for 16.1 overs from the end opposite to the pavilion to return with his 14th five-wicket in an innings haul in his 31st game. Having accounted for the wicket of opener van Zyl last evening, he added the wickets of the other opener Dean Elgar, rival skipper Amla, Simon Harmer and Morne Morkel today by making the ball 'talk' on a spiteful pitch. He sent back Elgar and Amla in the space of three balls in successive overs to leave Proteas gasping at 11 for four. Left-arm spinner Jadeja was not too far behind and sent back danger man A B de Villiers for a duck, Faf du Plessis and Dane Vilas today to add to his wicket kitty that already had Tahir on Wednesday. The deliveries that got rid of de Villiers and du Plessis were classy ones, the first one stopping and deceiving the batsman who put up a return catch and the second turning across the face of the bat and clean bowling du Plessis. At the fall of de Villiers, the South African scorecard painted a sorry picture after reading 12 for five before the lower-order and let-offs by the Indian fielders helped them to improve the total. 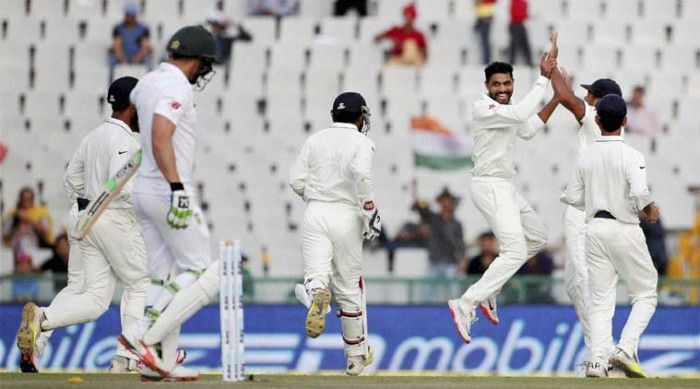 Mishra, brought into the attack late in the pre-lunch session, got rid of the stubborn Duminy who was let off by Indian skipper Virat Kohli and wicketkeeper Wriddhiman Saha, both off Ashwin's bowling earlier. India lost in-form opener Murali Vijay (5) cheaply to Morne Morkel before Shikhar Dhawan (39) and Cheteshwar Pujara (31) added 44 runs to help India cross the 50 mark. Pujara looked in good touch by hitting Kagiso Rabada and Duminy for fours in successive balls before the latter deceived him with an arm ball that crashed into the off stump as the batsman played for the turn. This brought together Dhawan, who was watchful, and Kohli and the duo put on a very useful 45 runs for the third wicket in 37 balls before both threw away their wickets by attacking Imran Tahir. The bearded leg-spinner, however, got his revenge by packing them off in the space of three balls spread over two overs. In fact, India were cruising along nicely at 97 for 2 when Tahir struck quick blows by grabbing three wickets in 11 balls spread over different overs by getting rid of Dhawan, Kohli and Ajinkya Rahane in quick time. Dhawan, who struck Duminy for three boundaries in one over, lost his patience when Tahir came on and got out to a reverse sweep shot, nicking behind. He hit 6 fours in his two-hour stay. Kohli, who struck 2 fours in 30 balls, too lost his cool in Tahir's next over and stepped out to loft him straight to long off where du Plessis took a well-judged catch. It was a poor shot to play when his team was pressing on for a big lead to shut the door on South Africa. Not to be left behind, Rahane departed at the stroke of tea while trying to slog Tahir's googly to be caught off the leading edge by a diving Duminy at backward point. India, 108 for 5 at the end of session two, folded up 72 minutes into the last session after adding 65 more runs. Rohit Sharma batted for 76 minutes and made 23 while staying with the lower order to help the hosts cross the 300-run mark. He was ninth out, dismissed by Morkel for the lanky pacer's third wicket, after adding 41 runs with Amit Mishra (14) who was castled by Tahir to end the innings. Tahir collected 5 for 38 after being brought on late as the fifth bowler. Chasing the highly challenging target in fading light, the Proteas started cautiously before the out-of-form van Zyl stepped out and drove Ashwin to short cover fielder Rohit to provide yet another early breakthrough for the home team. Similar to the first innings, Tahir was sent in as night watchman to shield the top order batsmen and failed to survive like in the first essay to carry on the battle, trapped leg before by Mishra.